Included in the package is our Perfect Palette 2.0 (requires 99% Isopropyl Alcohol to activate colours), 10 makeup brushes, 50ml FX blood, 50ml adhesive remover & 30ml of NimbaFix, the best product available for gluing silicone appliances to the skin for a long-lasting hold, even in difficult areas like around the mouth. The package comes in a tough plastic case so you can have this spectacular kit ready to go whenever you need a complete, professional zombie look, with a break-proof mirror (polished steel) mounted inside the lid for ease of application ‘on-the-go’. 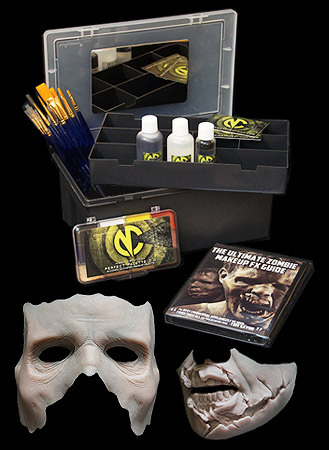 This kit can last for years, making it ideal for haunts, scare attractions and Halloween events. 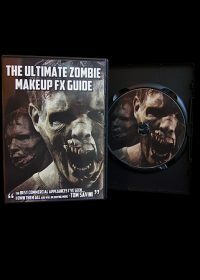 Comes with a FREE Ultimate Zombie Makeup FX Guide DVD which will show you all the techniques you need to apply, paint and even distress your clothing to complete your zombie look. 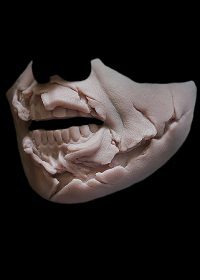 Read our 6 Tips for Creating a Perfect Zombie for additional makeup techniques. All in all a great package. The silicone prosthetics are perfectly detailed and so soft and supple it feels like real skin. Kinda creepy in a very good way. Very well put together kit. Just add alcohol (for the makeup) and go.